This article explains step by step procedure to implement cascaded dropdown list in SharePoint list. I was recently working on large list with many fields were in these fields are dependent on other list fields as well as fields has to be populated based on the selection of previous field value. SharePoint doesn’t support cascaded dropdown list field as out of the box. But this can be implemented in 3 ways. They are given below. 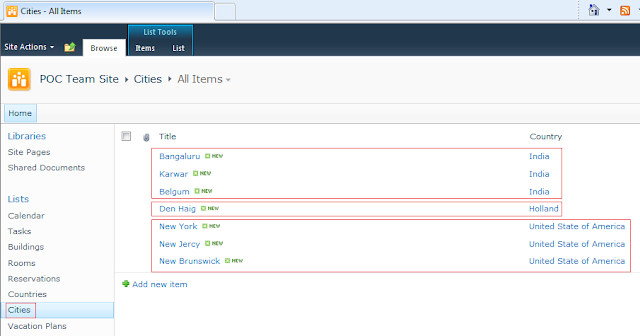 In this article, I will explain how to implement cascaded dropdown list in SharePoint list using JQuery. I will be creating 3 custom lists in SharePoint 2010 site. Below steps explains how to implement cascaded dropdown list in SharePoint list. This section explains creation of Countries custom list. This list acts as parent list and will store list of countries. Follow the below steps to create Countries custom list. v Go to SharePoint 2010 site. v Click on ‘List’ link in the Left Navigation bar. Click on ‘Create’ link. See the below image for more information. v This will open list creation pop-up window. 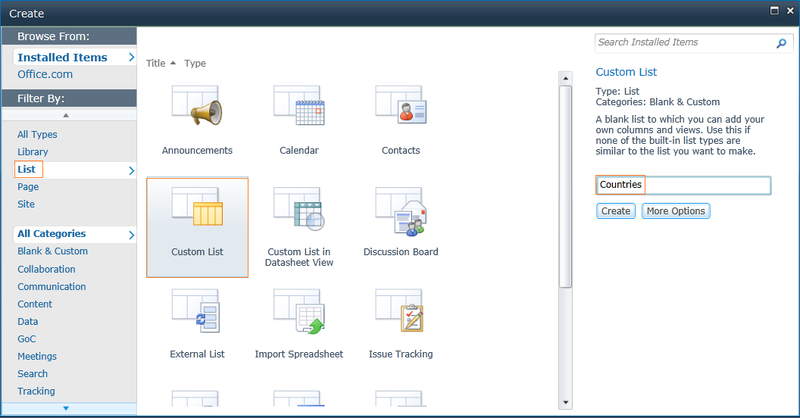 In the list creation pop-up window, select ‘List’ option in the Left Side and select Custom List as template. 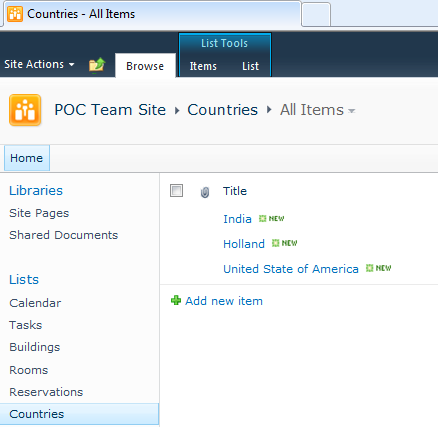 v Enter list name as ‘Countries’ and select ‘Create’ button. See the below image for more information. v After creating Countries custom list, add items to list. See the below image for more information. This section explains creation of Cities custom list. This list acts as child list and will store list of cities. Follow the below steps to create Cities custom list. v Create custom list as Cities. Follow the steps explained in Countries list creation section. v Create 'Country' column with below information. o Click OK to create Country column. v Add items to Cities custom list. See the below image for more information. This section explains creation of ‘Vacation Plans’ custom list. This list implements cascaded dropdown lists functionality i.e. based on selection of ‘Country’, cities will be populated to dropdown list. Follow the below steps to create ‘Vacation Plans’ custom list. v Create custom list as ‘Vacation Plans’. Follow the steps explained in Countries list creation section. v Create Country column with below information. v Create City column with below information. o Click OK to create City column. To implement cascaded dropdown list, we need to download below jquery files from Jquery site. Upload these two files to any document library where everyone has access to it. I would suggest to upload these files to document library of top level site. See the below image for more information. 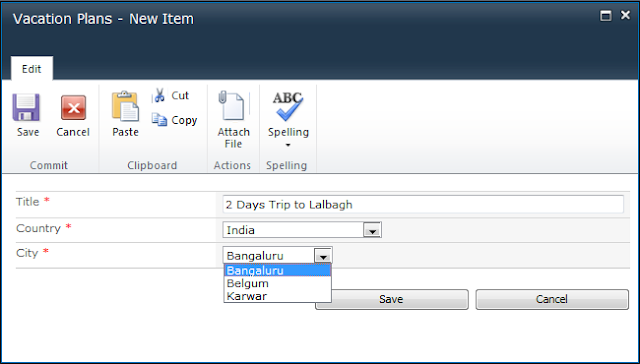 Follow the below steps to add jquery scripts to NewForm.aspx and EditForm.aspx file using SharePoint Designer 2010.
v Open ‘Vacation Plans’ list in SharePoint Designer 2010.
v Open NewForm.aspx and EditForm.aspx in advanced mode. See the below image for more information. v Add the below script in both NewForm.aspx and EditForm.aspx page. Insert the script below <asp:Content ContentPlaceHolderId=”PlaceHolderMain” runat=”server”> this tag. See the below image for the script. v Save the files and check-in. 1. Go to ‘Vacation Plans’ list and click on ‘Add a new Item’ option. 2. Select ‘India’ as Country. You could be able to see all Cities under India are populated to City dropdown list. Provide your valuable feedback if this article is useful to you. Also don't forgot to post your queries/issues if any. Thanks ... works like a charm. I added a third list, and duplicated the SPCascadeDropdowns section with the new listname and column names ... this also worked great! You can download it from the JQuery site itself or search it in the google you will get lot of references. I have not recorded any video. Please follow steps and let me know for any issues. What if I need to use this across different sites? Do I need to make the same lists in all the sites? Moreover there is no good way you can copy lists with lookup columns from one site to another. My scenario is the following: Building has multiple spaces. Ticket is created for a space to be cleaned. Therefore as part of creating ticket the user must select building & based on that, space. I have followed same steps but it's not working either not giving any error. My city is not filtered on the basis of country.On city dropdown all countries are populaed. 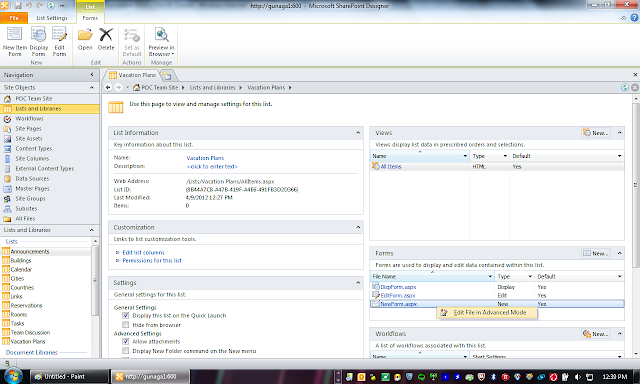 I am using SharePoint 2010 and the same thing happened to me as happened to Gupta. All cities are populated no matter what country I select. Same here. It's not working All cities are populated. I was trying the same. but not getting the required result. then i realise i change the Title of Column in Last List i.e in parentColumn: & childColumn:. then i put the Title instead of Internal name and is work :). childColumn: "Match", //Internal name not working. childColumn: "Match In City", // Title working. Can anyone please offer me some insight on what I'm perhaps missing? Hi Nagendra Gunaga! thank you for post!